Look at that poster. Just look at it! Those were the players you'd play against in NBA Jam, but never choose for your own team. All your favorites that you haven't thought about in a decade are getting together this Sunday for a game in Macau, the gambling and entertainment oasis for rich Chinese businessmen. 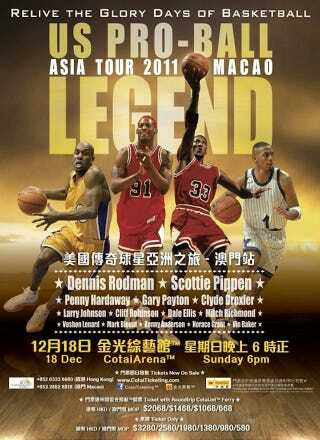 Yes, the "US Pro-Ball Asia Tour 2011" is the equivalent of Mötley Crüe's Las Vegas residency: bloated former stars go through the motions for an audience that doesn't know any better, and also Vin Baker might choke in a puddle of his own vomit. Tickets start at an affordable $72 USD, but don't worry about it. Scottie Pippen says he doesn't need the money, remember?